Gazeley Coachbuilders Ltd, Unit 14 & 15, Acorn Business Centre, Oaks Drive, Newmarket, Suffolk, CB8 7SX. Whilst Gazeley Coachbuilders Ltd are pleased to advise of the number of stalls available in each vehicle, it is essential that the Gross Vehicle Weight is not exceeded when fully laden. The legal operation of the vehicle remains the responsibility of the user/purchaser; therefore Gazeley Coachbuilders Ltd respectfully suggest that intending purchasers establish the un-laden weight of the vehicle of their choice and also of their intended load. 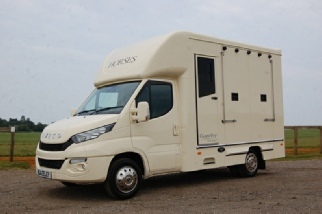 Gazeley Coachbuilders Ltd are approved accident repairers for most major insurance companies and can maintain and repair all makes of horseboxes. Trade Descriptions Act 1968; The mileage shown on the odometer cannot be guaranteed and the seller accepts no liability whatsoever for any inaccuracy.